If you have a different servo bracket configuration, the pan and tilt axis may need to be inverted. To do so, invert the sign on the values of panStepSize and tiltStepSize. Similarly, increasing or decreasing these values will change the sensitivity of the movement, larger numbers corresponding to more degrees moved per face detection frame. In the video you compare the RPi setup with an Arduino style setup, which runs more smoothly. Could you please expand upon the Arduino style setup? Do you know how to train a new haar casade object XML for detection? 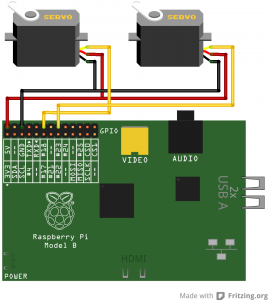 My RPi does not seem to start up when I have one servo connected to 5V, GRD, and Pin 18 as shown in your diagram. Is there any reason why it should not start up? Thanks. It’s not recommended to power servos with the Raspi 5V because servos draw more current than the Raspi can supply. Power the servos with an external 5V source and share a ground between that power source and the Raspi. 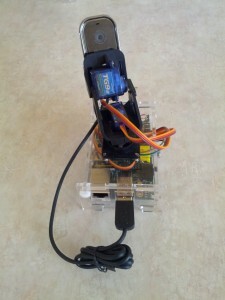 Can the RasPi camera module be used in this way to face detect? Do you know if there is any way to have a higher framerate? I mounted the raspberry with 2 servos g9 from deal extreme that does not move any servos even putting external power source, which I can do?? I had same an issues problem. But the problem is how is GPIO activated the pins. I used same servo as ur. I was considering using GPIO.output(pins, boolean). How can i start-up the program directly with my usb-camera? Hi, I did exactly the same kind of program a while ago and I had issues with the frame rate in OpenCV. I wrote my code in C/C++ with a CVhaardectect and the .xml file provided with the library. My code is running slow, like 3 or 4 frame per sec. Do you have any trip and/or tricks to speed the program up ?? Any guidance or clues would be very much appreciated. I think I solved my own problem just now. I navigated to ~/PiBits/ServoBlaster/kernel and then ran the ‘make install_autostart’ from there and it worked. But I m a newbie. I used 2 days for installing and find out the bugs of my raspi installation. Now all things are passing. When I do the “sudo modprobe servoblaster” I get an error message. But when I reboot, the servoblaster is activeted (?). Hi , I’m getting the same error , did you find any solution ? Your webcam is not being detected. hello.. i just want to install openCV and not with servo face tracker .. so i gave that first command, but its not working pleas help me.. can u give me some idea regarding this.. thank you..
can;t get servo to work. All i got face recognition working I am using raspberry pi. Good day, i am new in raspberry pi projects and language. 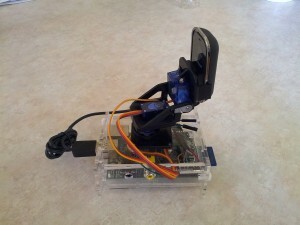 I want to do the same project but using Raspberry pi camera not the USB cam, how can I archive that? Why is this page still up? It does not work- as several posters have pointed out. If the instructions are followed precisely from beginning to end without the promised result being achieved it’s not much of a “tutorial” and more an elaborate prank by the author to see the number of cumulative hours that can be wasted from gullible individuals diligently trying to learn about new technology and better themselves. It’s only a “contribution” to the community if works and the instructions given are not demonstrably wrong. Leaving this online and uncorrected when the author knows it will not work and will waste at least two hours of time of every unfortunate individual who tries it is simply malicious and undermines the spirit of Open Source. Flooding Google with non-working tutorials does nothing to help anyone- except perhaps the authors page rank. I can confirm this works with minor changes to the steps. The part about make install_autostart needs to be ran in the ServoBlaster/kernel directory. As for me, it still does not auto start, but I have to run servod before running the program. Great tutorial, I got this working. I would like to use the code from opencv’s camShift.py instead of facedetect.py – I an ultra newbie, and I don’t know python, at all… Any chance someone could help? I basically want a selectable target pan tilt camera, this code is awesome for face tracking, but I need it to follow a selected object like camshaft.py does and move the servos… Thanks in advance. I work on your tut, but my screen very lag. How can I decrease pi resolution for increasing speed? Hi sir, what Pin Servo connect? the message is : modprobe: FATAL: Module servoblaster not found.